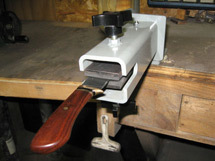 I continue to carrying the knife-maker's vise and attachment made by Chuck Ward. This is the most versatile clamping tool I have ever seen for everything from hand sanding to detailed handle work. I've sent a whole lot of these vises out over the last few years and the demand just keep growing for this great shop tool. Just drop me an email or a note on my "contact" page above to place your order. 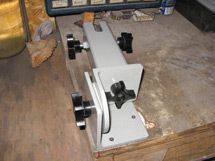 This is the standard version of the vise. The base plate can mount anywhere you'd like and the 7 1/2" deep "throat" can be rotated 360 degrees and locked into place with the back knob. The jaws the vise are 1 7/8" across. There are also slots in the top of the throat allowing the knife to be held crosswise or at an angle (as well as straight out) that are 2" deep. 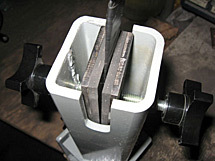 The jaws of the vise are free floating to accommodate any knife angle as well as rubber coated to protect and securely hold your knife. 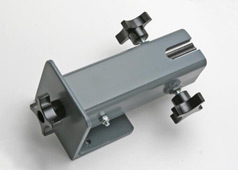 The standard vise is $95.00, plus $15.00 for Priority Flat-Rate shipping. 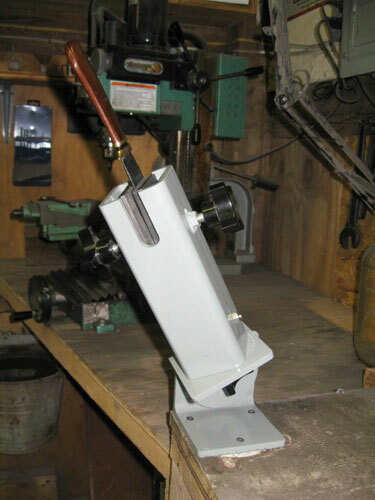 Chuck has also come up with a new attachment for the knife-maker's vise. An extra angle plate and locking knob will now allow your knife-maker's vise to swing 180 degrees adding even more complete and secure access to your entire work surface. 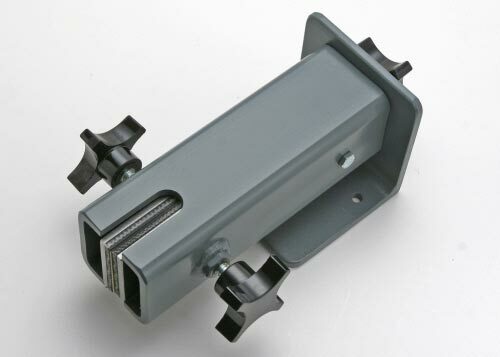 The knife-maker's vice attachment is $30.00, plus $10.00 for Priority Flat-Rate shipping.